Windows 10 has improved a lot since the previous Windows 8 version and gives you better experience and productivity like version 7. It offers a lot of settings that you can perform to get the annoying features out of the way. In this article, you'll find tweaks that you can perform to make Windows 10 more personal for your everyday use. We are going to take a look at some of the tweaks that makes your Windows 10 experience smooth and productive. You can perform these tweaks using third party apps as well. However most of such apps are premium. So I have listed tweaks which you can do on your own without harming your operating system in any way. Let's get started to tweak the Windows 10. You can turn off Live-tiles from your start menu. If you don't want them to show on start menu then simply unpin them. In order to do that just follow the steps below. 1. Click on start menu button. 2. Find the tile you want to get rid of and right click on it and select ' Unpin from Start'. If you do this for all the tiles then you can get back the old view for the start menu. Recommended: How to enable Hibernate option in Windows 10? Follow the instructions to make transparent taskbar. 1. Click on start menu button and select Settings. 2. Go to personalization options. 3. Select colors from left hand sidebar. 4. Move the slider button to enable "Make Start, taskbar, and action center transparent". You can now able to see transparency effect for the taskbar. Apart from making the taskbar transparent, you can set custom color for taskbar. 1. Go to personalization options. 2. Select colors from left hand sidebar options. 3. Disable button called "Automatically select the accent color". 4. Choose custom accent color of your choice. If you don't like the start menu with or without tiles then you need to use classic start menu. Windows 10 has a mix of Classic Menu and Tiles system which many users may not like for everyday usage. You can use Classic menu but for that you have to use third party apps like Classic Shell. This app is free to download and you can customize the Windows 10 appearance to make it look and work like Classic desktop. 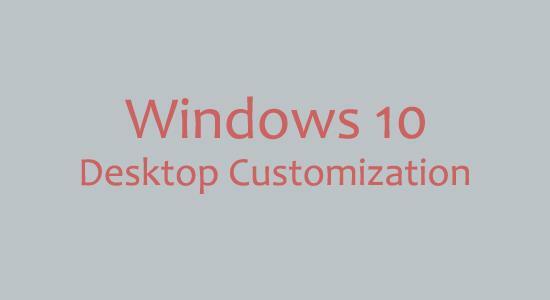 This shell gives you plenty of options to tweak the settings of the desktop. Drop shadows is a good visual effect for desktop. However for those with low RAM may find it draining the performance of the system. Follow the instructions below to disable drop shadows effect. 1. Click on start menu and search for "Advanced system settings". 2. Go to advanced tab and click on settings button on performance options. 3. Click on Visual effects tab and select "Custom" radio button. 4. Uncheck "Show shadows under windows" option. 5. Click on Apply and then ok button. After this you can see the change immediately. You can download visual styles and themes for the Windows 10 from online websites. And then you can install them in this folder. This directory holds the themes that you can change from the personalization settings. Adding a new visual style or theme in this folder will allow you to select new theme from the settings. If you notice any issues installing themes due to permission, in such case it is better to use UX Theme Patcher. This small app patches visual styles .dll file that allows you to use external visual styles within Windows. Windows 10 has this new feature which allows you to make your experience more productive. Now you can sort and put the multiple applications in different desktops. You can create a new desktop by simply using Windows key + Tab. And while you hold this combination click on the right hand side of the bottom screen area. This will create a new desktop that you can use with new apps. This is a very small app that has around 200 tweaks for Windows 10. This app can fix a lot of your problems and make your windows experience even better. You can download it from The Windows Club. This app is free of cost and doesn't require any installation either. Just execute the program and you get to make the changes on your system. There are many other tweaks that you can do to make Windows 10 perform as per your requirement. The more you explore there are many tweaks that you can find for Windows 10.